In Tasmania, feral European bumblebees may be boosting the spread of environmental weeds -- see details below. If European bumblebees were brought onto the Australian mainland, these types of plants could become serious weeds there too. The following information was researched by Dr Andrew Hingston, University of Tasmania, in 2006. Rhododendron ponticum is native to the Mediterranean and is a serious weed in the British Isles and northwestern continental Europe. In Tasmania, R. ponticum was not recorded as naturalised in the late 1990s. However, according to Matthew Baker of the Tasmanian Herbarium, large numbers of seedlings have recently been seen at several locations in western Tasmania. John Tooth of the Rhododendron Association of Southern Tasmania has also noticed that the percentage of fertilised flowers in tall Rhododendron species with non-tubular flowers, such as R. ponticum, has increased from approximately 15% to around 85% since the introduction of bumblebees. The major pollinators of R. ponticum in Europe, both in number and effectiveness, appear to be bumble bees and similar-sized carpenter bees. This suggests that bumblebees may be responsible for the sudden naturalisation of R. ponticum in recent years in Tasmania. There currently are no bumblebees in mainland Australia and this weed is restricted to small infestations in the Blue Mountains (NSW) and in the Dandenong Ranges (VIC). The white-edged nightshade is native to northeastern Africa and is a common weed in Tasmania, New Zealand and California. Although it was naturalised in Tasmania before bumblebees arrived, its status has been upgraded from secondary to noxious since bumblebees became established in Tasmania. The commercially grown tomato, Solanum lycopersicum, is in the same genus as this weed. Both tomatoes and this weed require a special type of pollination called buzz-pollination. 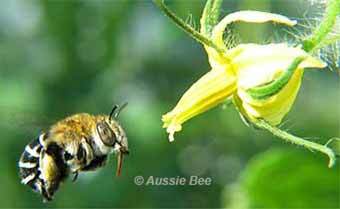 Bumblebees are used for tomato pollination overseas because they are good buzz-pollinators so bumblebees may also be buzz-pollinating the weed, S. marginatum, in Tasmania. Presently, this weed remains uncommon on the Australian mainland where it is naturalised in only a few locations in Victoria and SA. The butterfly bush is a tall shrub that is native to China. It is a weed in Europe, the USA and New Zealand. This plant first became naturalised in Tasmania between 1970 and 1990. Andrew Crane, Regional Weed Management Officer DPIWE, believes that this is another species of introduced plant that has recently become more invasive in Tasmania. Andrew Hingston has observed that the only common daytime visitors to B. davidii in Tasmania are bumble bees and commercial honeybees, and that bumble bee queens find it particularly attractive. Honeybees may not have long enough tongues to regularly contact the stigmas of B. davidii, inside its narrow flowers. In contrast, the longer tongues of bumblebees are likely to make better contact. Hence, bumblebees could be more effective pollinators of B. davidii than honeybees, and could be responsible for the spread of this weed in recent years. B. davidii is presently only a minor weed on the Australian mainland. The South African lily is a minor weed in New Zealand. It was not naturalised in the late 1990s in Tasmania, but it is now regarded as one of the worst environmental weeds in some parts of Tasmania. It is possible that bumblebees have contributed to the sudden invasiveness of A. praecox in Tasmania. Recent research by Andrew Hingston has shown that bumblebees are the most common visitors to this weed's flowers; bumblebees contact the stigma and anthers significantly more often than honeybees do; and bumblebees carry significantly more A. praecox pollen than honeybees do. The South African lily is presently only a minor weed in Victoria, the Blue Mountains (NSW) and the Adelaide Hills (SA). What would happen to mainland populations of these weeds if European bumblebees were imported? 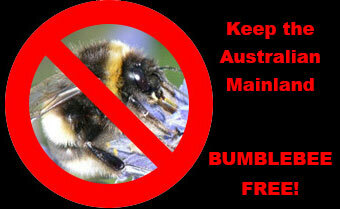 Keep the Australian Mainland 'Bumblebee-Free'!